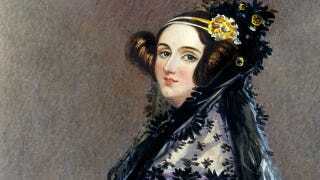 Does the name Ada Lovelace ring any bells? No? Seeing as you’re reading this on a computer, tablet or smartphone, it should. The Victorian mother-of-three, born 1815, was the world’s first ever computer programmer. A close friend of Charles Babbage, inventor of the Difference Engine (considered the first ever computer), Lovelace was tasked with translating notes from Italian mathematician Luigi Menabrea on Babbage’s second mathematical machine, the Analytical Engine. Lovelace went one better, using her own formidable mathematical knowledge to expand upon Menabrea’s notes, leading to her describing an algorithm that could compute a recognised series of numbers, effectively the first act of computer programming. Lovelace, regardless of the importance of her formative programming work, was a fascinating character for many reasons. The (only legitimate) daughter of lothario poet Lord Byron, she lead a racy life including numerous affairs and an ambitious (and ultimately, damningly failed) attempt to create a mathematical model to ensure gigantic bets would reap profits. Dying at the young age of 36, it was a life few could match in twice as many years, and one that should be far more widely recognised than it is today.